KIEV, Ukraine -- It's a vicious feud that has poisoned Ukrainian politics for a decade. 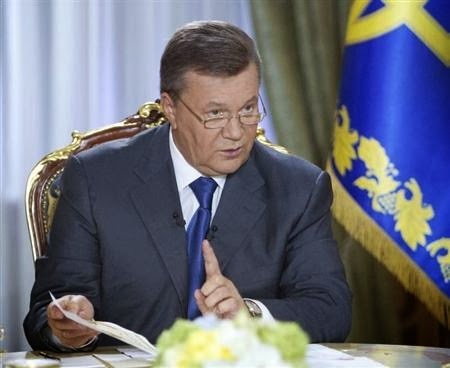 Ukrainian President Viktor Yanukovich speaks during a television interview in Kiev in this August 29, 2013. Now the bad blood between President Viktor Yanukovich and Yulia Tymoshenko, his jailed opponent, seems the only real bar to a landmark deal with Europe that offers Ukraine an escape from centuries of Russian influence. She is serving a seven-year jail sentence for abuse of power but the European Union, with which the ex-Soviet republic hopes to seal agreements on association and free trade next month, wants her released. It says the former prime minister is the victim of political maneuvering and the way she has been treated does not befit a state poised to take a foothold in the democratic mainstream. No-one doubts Yanukovich's desire to sign with the EU. And, on the surface, the Tymoshenko issue ought to be easy to solve. EU mediators have offered Yanukovich a way out, suggesting he pardon her so she can go to Germany for medical treatment. That would avoid the need for time-consuming changes to legislation. With this option, Yanukovich would get a hefty pat on the back from the 28-member EU and land a deal that would earn him a niche in history. That should fortify him for a bruising time ahead in relations with big neighbor Russia which is readying for "protectionist" action against its former Soviet ally because of its swing to the West. His magnanimity might even cut the ground from under the opposition in time for his 2015 bid for re-election. It might bring a gentler, more human touch to his image of unforgiving, bullying hard-man. Both Yanukovich and Tymoshenko are creatures of the brutal early years of post-Soviet independence, a rough world of winner-takes-all when wealth and power were amassed and the alliances and elites of today were forged. Yanukovich, a burly 63-year-old former electrician, fought his way up the ladder of power in the bruising arena of the Donbass mining region. His power base is in the east where he is backed by Ukraine's wealthiest industrial barons. She made a fortune as a gas trader in the mid-1990s, earning the sobriquet 'gas princess'. She draws most of her support from central and western areas, particularly Ukrainian-speaking ones. A fiery-tongued populist known for her trademark peasant-styled hair braid, she was a leading light in the 2004-5 'Orange Revolution' protests that doomed Yanukovich's first bid for the presidency. The country's highest court overturned his victory, on the grounds of irregularities, and he lost to Tymoshenko's ally Viktor Yushchenko in an unprecedented third ballot. To this day, he believes he was robbed of what was rightfully his, aides say. As prime minister, she became the scourge of Ukraine's super-wealthy by launching a policy of re-nationalizations of enterprises which she said had been sold off cheaply to favored oligarchs. Most of these are Yanukovich's backers today. When he made a comeback in February 2010, she ran him close for the presidency after a bitterly-fought campaign in which she heaped personal invective on her opponent. Following a 2011 trial which the West said smacked of "selective justice", she was jailed for abuse of office linked to a gas deal which she had brokered with Russia as prime minister. The Yanukovich government says the deal saddled Ukraine with an exorbitant price for Russian gas supplies. Yanukovich's dislike of the sharp-tongued Tymoshenko, who once branded him a "common coward" on state television, is such that only in the past two weeks has he been able to bring himself to pronounce her name in public. He has recently begun to hint at a breakthrough via EU mediation. But he still maintains he has no powers to overrule the courts and send a convicted criminal abroad for treatment. This argument only draws derision from the opposition which berates Yanukovich for his dictatorial style and say he has the courts under his thumb. "The mechanism is simple enough," Arseny Yatsenyuk, one of three main opposition leaders, said with mock incredulity to a question on a TV chat show. "A pen, a sheet of paper, a decree from the president of Ukraine pardoning Yulia Tymoshenko. Signature - Viktor Yanukovich," he said. Job done. The pressures, though, are now mounting on him to let her go to Germany for medical treatment at Berlin's Charite clinic - an offer which she now says she is ready to accept "for the sake of a successful Ukraine". Threats of retaliatory trade action from Russian President Vladimir Putin and his aides have drawn an angry response from Yanukovich's big-business backers and may have served only to convince him that the EU path is the one to take. And though the EU's formal position has still to crystallize, EU member states would still like him to free her before the watershed summit in Vilnius, Lithuania, on November 28-29. So, will he, won't he, let her go? Last Friday, in advance of a visit to Poland, Ukraine's cheerleader in Europe, Yanukovich fired a top prosecutor who has been building other, more serious, criminal cases against Tymoshenko. This seemed a clear gesture to the EU ahead of Vilnius. And on Monday, the daily newspaper Segodnya owned by one of Yanukovich's wealthy backers carried a portrait of Tymoshenko under the headline "Guten Tag, Berlin!" But he still has to make a solid announcement on her case. Uppermost in his considerations, commentators say, is that Tymoshenko could recharge her batteries in Germany and return to the political fray after treatment to challenge him in 2015. Her legal status as a convicted criminal might well prevent this. Her lawyer says she seeks "full rehabilitation", apart from release, and the details of any 'exit package' for her might yet prove to be a sticking point. She has done nothing to allay Yanukovich's worst suspicions about her intentions. In typical feisty fashion, Tymoshenko declared on Friday that while she was ready to take an offer to go to Germany for treatment she did not intend to seek asylum or emigrate. She accused her nemesis of seeking to build a "European" Ukraine "on the basis of dictatorship, clientelism, corruption and political repression". "I will actively take part in freeing Ukraine from dictatorship," she declared. There has been a realignment in the opposition during her absence, though, and Tymoshenko may be a diminishing force. Yanukovich may see the real threat to re-election coming from newly-emerged opposition leaders, notably heavyweight boxing champion Vitaly Klitschko. Nonetheless, analysts say, Yanukovich does, almost irrationally, fear retribution or some sort of revenge from Tymoshenko were she to be released from confinement. These analysts say he might still be waiting to see how the EU position shapes up as the Vilnius summit approaches. He may be hoping that, within the ranks of the EU, geo-political expediency and the historic chance of prising Ukraine free from Russia will outweigh principle. "He might take this to the wire, hoping he can get a signature without letting her go" said one diplomat. Yulia Mostovaya, Editor-in-Chief of the weekly Dzerkalo Tyzhnya, said it was now down to Yanukovich and Tymoshenko to back down from entrenched positions for the good of Ukraine. "This is about the fate of the country," she wrote. "The question is: which of them - Yanukovich or Tymoshenko - will pardon the other. The one who makes that step will not necessarily win, but will give the country a chance." "But if they go head-to-head then everyone can lose," she said.